Honestly, it’s hard for me to tell what week it is. I’m still in a bit of denial about it being 2014 already – much less nearly the end of the first month of 2014 – so you’ll have to forgive my inability to tell what week it is. Furthermore, I’ve been in the grips of some kind of malaise, most likely brought on by my immune system fighting off the double-volleyed attack of dd’s stomach bug from last week and ds’ continuing cold. Actually, both kids have pretty awful colds, with dd having the worse of the two right now. I think Proctor & Gamble is making a FORTUNE off us right now, for all the boxes of Puffs with Lotion we’ve gone through in the last few weeks. And so, not feeling particularly well for the last several days – plus just still very discombobulated for the last several weeks – my weight loss hasn’t been where I want it to be. Since I ended up losing about 10lbs last year off my starting point, I’d like to see if I can take off the other 10 I wanted this year. Sure, that’s backing down from the whole “losing 20lbs in one year” thing…but, sincerely, I DON’T CARE. This is a marathon, not a sprint, and I’d rather do this in a fashion where I don’t stress myself out so much about the numbers that I miss the healthy forest for the weight loss trees. I’m up a couple of pounds, thanks to improper levels of hibition over the first few weeks of the month so…ONWARD AND DOWNWARD, yes? I grew up with “The Muppets” and “Sesame Street”, and Jim Henson has always had a somewhat god-like status in our house, because he managed to be so funny, clever, inventive and astonishing. Reading Jones’ incredibly detail-oriented biography of Henson, you see that he’s all that and more. 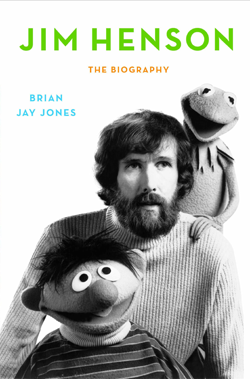 Through the book, I heard about projects I never knew he’d done (such as the incredible amount of advertising the Muppets did, the shows he did in Washington, DC that preceded my appearance on the planet, and several other works for TV that I just don’t even recall, such as “The Storyteller”). I also read about things that were less joyful – sad things that happened to Jim and his family, sad things that Jim did (humanizing him by really showing that he was, in fact, a human), and the sad details of his final hours. What you walk away with is a sense that Jim Henson – and the amazing cast around him, particularly long-time collaborator Frank Oz – had a burning need to continue to do things that hadn’t been done and, through the variety of endeavors that did well (like “Sesame Street”) and that didn’t do as well (such as “Labyrinth” or “Dark Crystal”), he managed to make incredible advances in puppetry, animation, animatronics, engineering, set design, and cinematography. Things he did out of necessity, such as putting monitors out of view, where puppeteers could see how things looked to the viewer, became staples of the industry because it just made sense and it made it all that much better. Jim Henson’s creations have certainly touched my life and made it better; I don’t want to know what life would’ve been like without Kermit the Frog. I just don’t. Jones puts meticulous detail into the book, almost down to the level of “…and Jim had toast with blackberry jam today, because the nearby store didn’t have his usual orange marmalade…” (NOT A REAL EXCERPT), but the book stays readable and comfortable. For someone like me, who had more than a passing acquaintance with Henson’s work, I perked up when someone I loved was coming up in the story, and I loved hearing the back stories on so many different projects he did. I’m even more in awe of Henson now than I was before I read Jones’ fascinating portrait of the artist, from before he was born up through the time just following his untimely passing. Fans of Henson’s work should read this book, for sure, and those who don’t have familiarity with his work should study it and then go rent a messload of DVDs. Jones’ rich and vivid descriptions do Henson justice through what Henson himself always strove for: passionate, gripping, and uplifting storytelling. This entry was posted in 21 books and 10 lbs, book reviews and tagged 21 books and 10 lbs, biography, book review, Brian Jay Jones, Jim Henson, Jim Henson The Biography, Labyrinth, Muppets, Sesame Street, The Dark Crystal, weight loss by crunchymetromom. Bookmark the permalink.